Mobile is big this year, and we mean B-I-G. And it shows no signs of slowing down even before Google launched Mobilegeddon in April. 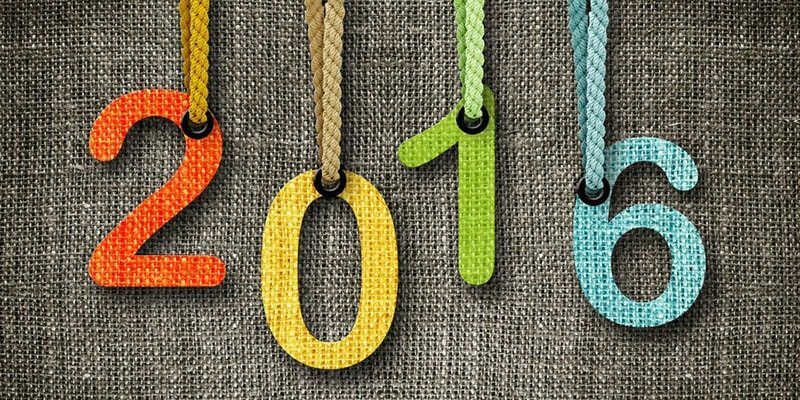 Here are the major changes in 2015 that will certainly pick up in 2016. As we can see in Google Analytics reports, Google is capable of raking in traffic results based on the device the searcher uses. Google has been using this technology since 2009 although we see search results that are typically based on similar ranking algorithms. That’s going to change this year; there’s a 99% chance that mobile indexing will happen this year. With the launch of Mobilegeddon comes a promise that the search engine giant will give priority to mobile-friendly sites for mobile searches. Clearly, mobile indexing is in the works. With this in mind, SEOs need to explore the platform deeper. The mobile user experience (UX) will be another point of competition by next year. Remember that Google is after a quality experience that’s why it ranks mobile-optimized sites higher than those that aren’t. Again, with UX in mind, Google aims to escalate the mobile experiences by almost forcing site owners to make their mobile sites fast. Dubbed as The AMP Project, mobile speed is another ranking factor to look at next year. 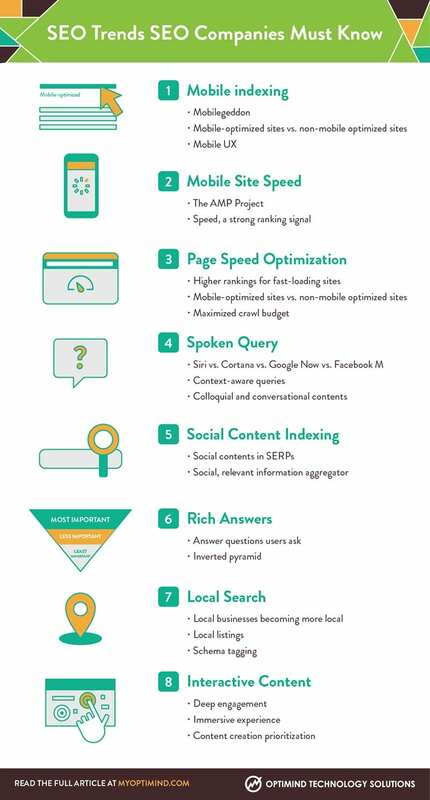 AMP stands for accelerated mobile pages for creating faster and more attractive mobile browsing experience. Experts themselves are skeptical more so because desktop site speed, while it is a ranking signal, is rather trivial. But don’t let the plainness of the statement fool you. Speed is a matter of fact, and roads lead to getting faster or lagging behind the competition. Some experts, on the other hand, figure that AMP is here to stay. WordPress, for instance, develops a plugin to the standards of AMP. WordPress is one with Google in providing users with a much better UX and if it means supporting a free and open Internet, then so be it. Page speed has been in the list of yearly trends, but the changing requirements around it are getting even more sophisticated that it cannot be taken out of the lists. For emphasis, all things being equal, a fast-loading website will always outrank a slow-loading website. Again, the requirements are getting more stringent. If a site didn’t load in 3 seconds, 40% of the visitors would leave. More than 50% of the visitors expect the site to load within 2 seconds. And a second delay could mean 7% loss in conversion. Let us not forget that Google allocates a crawl budget to every website. Yes, it crawls your site for a specific period. So, if your website loads very slow, it will eat much of that crawl budget, leaving other unimportant pages uncrawled and unindexed. What Siri, Cortana and Google Now and now, Facebook M have in common? Yep, your answer is the same as mine. These are digital assistants that make our lives easier and more convenient with each use. However, for digital companies including any SEO company, these vutlers (virtual butlers) are a completely different story. These are game changers. In fact, in a one-day survey conducted by PhoneArena.com, about 34.36% of online users are using Google Now every day, 29.99% use it every now and then, and only 35.65% have never used it. Evidently, once these vutlers get into you, you cannot stop using them; they become pervasive. These are long-tail keyword queries with context-aware results. Search is more complex than ever. And they pose a serious challenge for SEOs. The goal this 2016 is to write contents that are colloquial and conversational in nature. Speaking of content, Google had already inked a deal with Facebook and Twitter regarding search news. So, don’t be surprised to see tweets in mobile SERPs (search engine results pages), for instance. We can only predict, but the signs are so strong we cannot ignore them. Google will heavily index more and more sites including social networking sites in 2016. Social media will become more relevant aggregators of information. Apparently, SEOs need to take note that the Internet and social media are getting boundary-less by the day. Social media marketing should no longer be an option, but a must. Rich answers are eating up the SERPs. Not only that, rich answers account for 35% of all search queries nowadays. Here is another SEO opportunity that we can all exploit. However, this too takes some getting used to especially since it means fewer positions in the results pages. On the other end, it could only be an opportunity if you help Google in answering the questions that users ask. So, appearing as a rich answer is not necessarily about the ranking, but about creating high-quality, unique and informative contents. Again, the emphasis is on long-tail keywords on contents that directly answer common questions about your niche. Looks like we cannot abandon keywords; not this 2016. And structure the content the way your readers would expect how it should be structured – most important information at the top. That’s the inverted pyramid FYI. With the power of mobile, along with the proliferation of digital assistants, there is an increased pressure for local businesses to be more local. This also means escalating demand to do local SEO much better than before. When a user searches for the nearest flower shop in Lackawanna using his Apple watch, make sure that your business will show up. It’s about country, state, and region as well as street and neighborhood. That’s how it’ll be in 2016 – local search becoming more local. Local listings and schema tagging are two of your priorities. Through this, you may capture more of the local market share by showing increasingly relevant results with their queries. If content is king, interactive content is the prince. Or, it could be the crown-stealer this 2016? While we have to wait and see to know the answer, let’s feast on what we already know – interactive contents can encourage engagement. If you think polls are the only way to do this, think again. There are many other ways such as online calculators, maps, games, videos, animations, and even the scrolling experience. The goal is to make it immersive and yet non-intrusive. Evidently, the challenge lies in creating interactive contents for both desktop and mobile sites. It would be difficult to create interactive contents for desktop websites hoping they will scale when viewed on mobile devices. So, content creation prioritization will come into play. It only goes to show that the Internet is an ever-evolving landscape. Nonetheless, the trends are geared toward these eight items although there could be more. One thing is for sure though: change is coming! Embrace it or decay.